With the allocated Rs 500 crore for the Delhi Metro Rail Corporation project, the implementation and execution of new corridors will become easier. 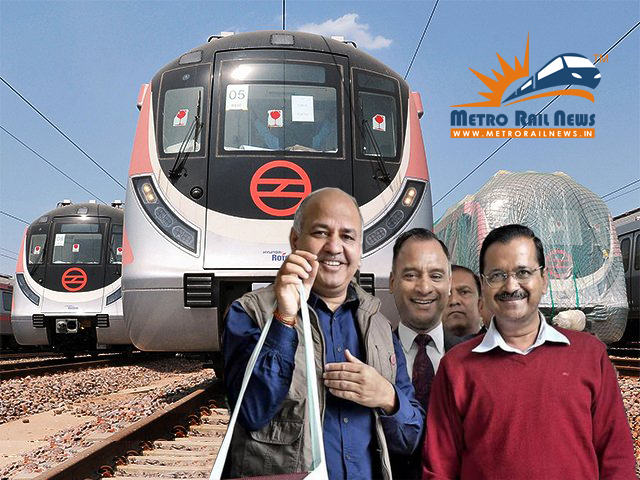 Delhi, Metro Rail News: The Delhi government in its budget which was presented presented on February 26, 2019, has allocated Rs 500 crore for Delhi Metro’s Phase IV. According to source, the 104 km long Delhi Metro’s Phase-IV project was estimated to be completed by 2025 after Delhi government’s in-principle approval towards the project in the month of February 2016. Now the project is yet to start, despite being approved by the Delhi Cabinet. The Central government has approved the proposal of the new Phase-IV project but there were fresh tiffs which broke out between the Delhi government and the Central government over the funds of the project. “The government has approved the proposal of Delhi Metro Phase-IV Project comprising six corridors with the length of 103.93 km. The total length of the Delhi Metro network will become 453.93 km after the completion of the Phase-IV project, ” Sisodia said. “I propose Rs 500 crore in the Budget 2019-20 for Metro Phase-IV project,” he added. The projects chosen under the Phase-IV are Rithala-Narela (21.73 km), Janakpuri West-R K Ashram (28.92 km), Mukundpur-Maujpur (12.54 km), Inderlok-Indraprastha (12.58 km), Tughlakabad-Aerocity (20.20 km), and Lajpat Nagar-Saket G-Block (7.96 km). The AAP dispensation early this month had accused the Centre of meting out “step-motherly treatment” to Delhi in the Union Budget, claiming that the Centre government had made “no provision” for the Metro’s Phase-IV project in it. “They have done it in giving financial assistance, and now they have done it in Ph-IV too, they have forgotten about it,” he claimed. The Delhi Metro had been given a grant of Rs 414.70 crore in the Union Budget 2019-20 as against Rs 50 crore in the last fiscal. The Arvind Kejriwal government had cleared the Phase-IV project in December 2018 and sent it to the Ministry of Housing and Urban Affairs. The Union government sources last month had claimed that the AAP dispensation had “stonewalled” the progress of the Delhi’s Metro’s Phase-IV project, leading to “substantial delay” and inconvenience to people. Union Housing and Urban Affairs minister Hardeep Singh Puri in January accused the AAP government of having a “behavioural pattern of creating hurdles” in response to conditions imposed by the Delhi government while clearing the project. Sisodia, after the approval of Phase-IV project, had said the city government would give its share of Rs 9,707 crore towards the construction work under the project, which is estimated to cost around Rs 45,000 crore. The fresh accusation had come amid an apparent tussle between the Centre and the Delhi government after Kejriwal imposed a condition of 50-50 per cent operational loss sharing while giving approval to the Phase-IV of the Metro network late December. A Delhi government official had recently said, “In the past one year, the ridership has gone down due to various reasons. So, if Delhi has to pay 100 per cent of the operational loss, it will not be financially viable for it”. Also, there are certain corridors that may not be profitable in the future or even do not reach the break-even level, the official had said. Housing and Urban Affairs Ministry sources had said the two conditions imposed by the Delhi government is “contrary to condition of sanction of the Phase-III of the Delhi Metro wherein operational losses are to be borne by the Delhi government”.